People travel for all kinds of reasons. Some travel to leave their lives behind for a moment and forget about the hustle and bustle of daily life. Some travel to experience new cultures and languages. Some travel to immerse themselves in the beauty life has to offer. Some travel to expand their knowledge and grasp of their business and trade. And for each of these travel motivators, there are specific locations and landmarks which are appeal to this group of travellers. Each traveller wishes to stand in awe in front of a chosen setting, landscape or marker and appreciate the history and aesthetics of a particular view. 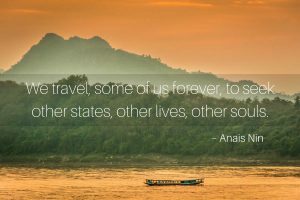 As part of the Rand Rescue travel (#RRTravel) series, we want to give our readers some unique insights on places to visit and things to see which are not necessarily covered in mainstream travel blogs. Kicking off this series, we are exploring some of the most unique architectural gems around the world. In general, one would not think that buildings or structures offer much pull for travellers, but this assertion would be wrong. Over millennia, people have flocked to certain regions to catch a glimpse of manmade landmarks. Think of the Eiffel Tower, Sydney Opera House, Statue of Liberty, Leaning tower of Pisa, Colosseum, Egyptian Pyramids, Machu Picchu, Stonehenge and all other prominent landmarks scattered throughout the world and it’s clear that these things have always fascinated humankind and will continue to do so for all eternity. But of course, you already know all the landmarks above, and for your next trip you’re looking for something different. Something you haven’t yet seen or experienced. So hold onto your seat, dear reader, we’ve got some architectural gems for you! 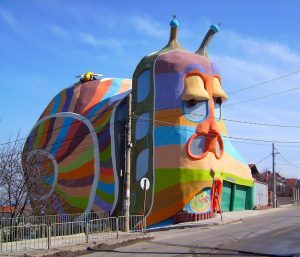 The Snail House on the outskirts of Sofia, Bulgaria, is not only unique in its architecture but boast a kaleidoscope of colour to mesmerise each and every passerby. At five stories tall, the Snail House has no straight walls, corners or edges to speak of. The brainchild of architect Simeon Simeonov, this unique building is used as a residential area and external features like lights, chimneys, ventilation and doors are hidden within the snail’s anatomy. This unique scientific building came about due to a compromise between entrepreneur Larry Ruvo (who had commissioned it) and architect Frank Gehry. 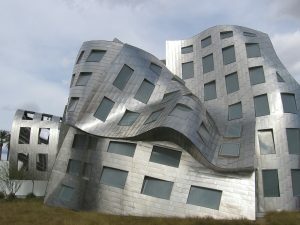 For addition to serving as visual revitalisation for Las Vegas, Ruvo had assured Gehry that the centre itself would not be limited to its initial purpose as an Alzheimer’s research centre, but include research for Huntington’s disease which Gehry himself had championed for years. 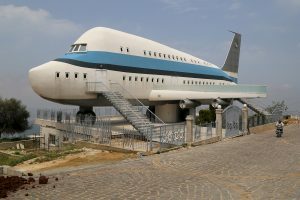 Located in the village of Miziara, Lebanon, this unique aviation house is but one of many unique buildings in the region. The building was constructed in the shape of an Airbus A380 and stands out among other residences built in the form of ancient Greek temples or Egyptian ruins. 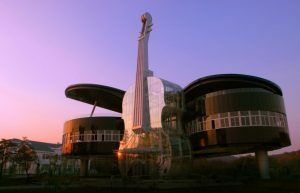 Constructed in 2007, the Piano House, shaped in the form of both a piano and violin, serves a a showroom for the Shannan district in China. The violin houses the escalators sand staircase while the piano forms the showroom. The building is constructed to a scale of 50:1 and was designed by the Hefei University of Technology. This entry may not be a modern day architectural marvel like other entries in this list, but it is just as mesmerising. 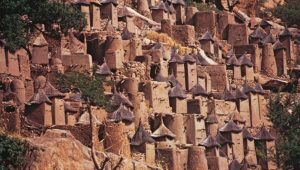 Situated on the steep cliffs of the Bandiagara escarpment, the sacred site is a showcase of Dogon architecture and religion which pulls one back through time and culture to a bygone era. 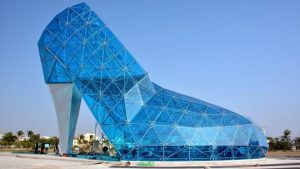 The Glass Slipper Church situated in the coastal province of Chiayi is truly an architectural gem. Though the jury is still out on its aesthetic value, the 320 tinted glass windows makes this chapel a place worth visiting. It’s administrator notes that it is used mostly for promotional services like wedding ceremonies and photo shoots and represents every girl’s dream of being a Cinderella who marries her prince. 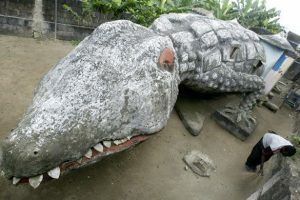 When one notes architectural gems, you don’t often envision Ivory Coast, but or Thierry Atta who resides in the Crocodile House, its is indeed a marvel. Designed by artist Moussa Kalo, the building was completed in 2008, a mere two months after the artist’s death. As Kalo’s apprentice, Atta took over the work and completed his home which also serves as an attraction for the people of Abidjan. The National Historical and Archaeological Museum Complex Sulayman was established in 1949 and completed during the Soviet era in 1978. 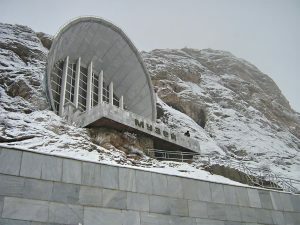 Today it is a Unesco World Heritage site which boasts more than 33 000 museum pieces in Kyrgyzstan. 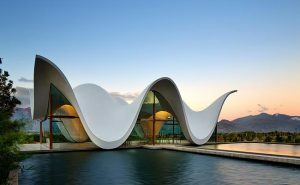 Built on the picturesque Bosjes Wine Farm in Wellington, South Africa, the elegant Bosjes Chapel was designed by Steyn Studio who claims that they wished to emulate the surrounding mountains and use the reflective pools to add the impression of weightlessness to the beautiful building. 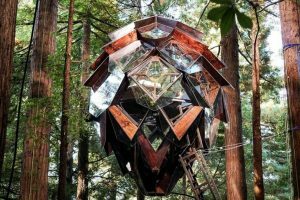 The Pine Cone Treehouse is one of the many marvels of designer and builder Dustin Feider who launched his company, O2Treehouse with the aim of urging people to reconsider their environmental impact. The structure has been featured on series like Treehouse Masters and Animal Planet’s Ultimate Treehouses. 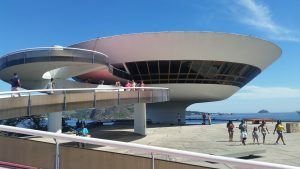 One of our more well-known features on this list includes the Niteroi Contemporary Art Museum in Rio de Janeiro. Completed in 1996, the structure is the combined brainchild of designer Oscar Niemeyer and structural engineer Bruno Contarini. The museum is projected over Boa Viagem beach and includes a 817 square metre reflective pool. Another entry Saffas can boast of is the Owl House in Nieu-Bethesda, South Africa. 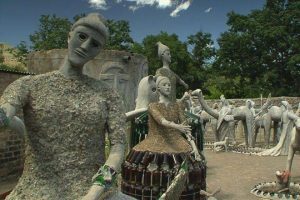 The dwelling, which is now a museum, was the brainchild of sculptor Helen Martins whose unconventional upbringing had sparked a journey fraught with depression and mental instability which had contributed to the remarkable architecture and interior design. As Helen could not imagine life without her light, she committed suicide in her later years as she was losing her sight. 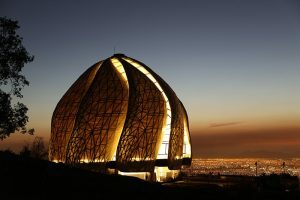 The Baha’i House of Worship in Santiago, Chile is one of the most impressive works we’ve seen in the modern era of architecture. Its nine-sided design is meant to symbolise the oneness of humankind and was designed by Hariri Pontarini Architects who described it as a Temple of light, faith and inclusion. 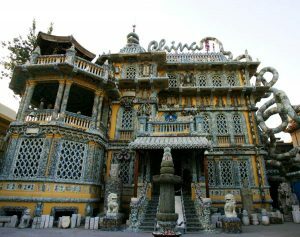 Also known as China House or Yuebao House, the porcelain house used to be a dwelling before it was turned into a museum. The house used to belong to a central finance minister during the late Qing Dynasty and was later refurbished and redecorated by antique collector Zhang Lianzhi. For travellers with a penchant for slopes and skiing, Dom Do Gory Nogami (or Upside Down House) in the Zakopane ski resort is a must-see. 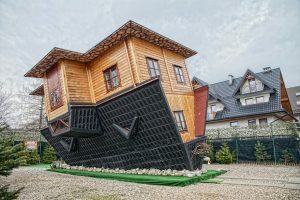 Not only is the house upside down, but everything else in the house is upside down as well, including tables, chairs, beds and toilets. Labassin Waterfall Restaurant may not be a natural waterfall, but the waters which flow into the watery diner is diverted from natural dams in the region. 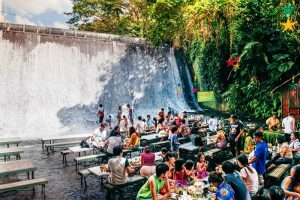 Situated in the Villa Escudero Plantations and Resort, the attraction allows for a truly unique experience. 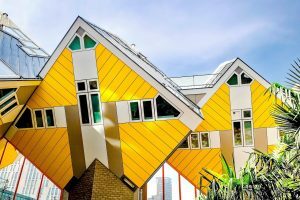 For visitors to Rotterdam, the Cubic Houses are a must see, if only for their quirky and colourful design. Located near the Blaak Subway Station, the houses serve as residences with the exception of one home which is available for tours. 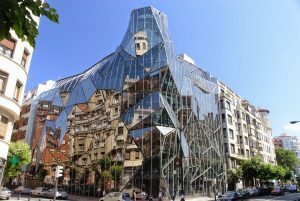 As one of our most contentious entries, the headquarter of the Basque Health Department has received its fair share of critique from locals and foreigners alike. In a city chock-a-block with architectural gems, many have ruled the building a sore eye, whereas others see it as a modern marvel of architecture. 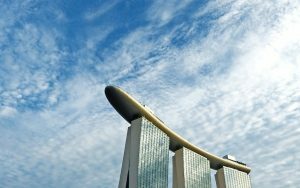 Built with a boat-looking roof terrace connecting the three 55-storey irregularly-shaped hotel towers, Marina Bay Sands Hotel for me signifies Singapore’s thriving tourism industry. At first, I couldn’t imagine that a building like this has been constructed merely for leisure: huge hotel rooms, casino, restaurants, bars, museums, and posh shops. We passed by its lobby on our way to Gardens by the Bay, and it was certainly crowded with tourists from all over the world. I wish we could at least visit the observatory area and see the infinity pool at the sky terrace, but I guess that’s something that will encourage me to visit Singapore again in the future. 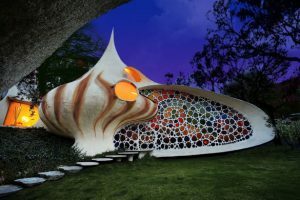 In addition to being one of the more colourful and homely structures in this article, the Nautilus House is said to be earthquake-proof as well as maintenance-free. The structure makes use of ferrocement construction which casts concrete over steel-enforced chicken wire. The design incorporates spirals and circles which flows through its concave chambers with rainbow-coloured stained-glass windows lining its walls and ceiling. The Svalbard Global Seed lodge is a structure which is not only unique, but highly practical. 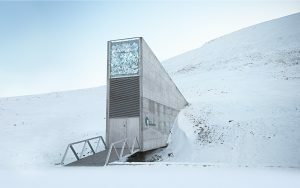 The vault was constructed to safeguard as many of the world’s unique genetic crops and houses these crops at a temperature of -18ºC. The vault is said to be capable of housing up to 2.5 billion seeds. Among Ulrich Muther’s many fascinating buildings is the Sea Rescue Station of Binz Beach in Germany. The designer’s work had gone unnoticed for many years given the political climate of Germany. 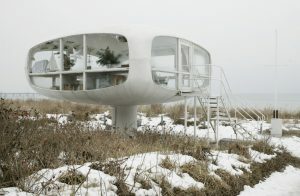 The world had taken notice, however, and today Muther’s work is considered some of the best in the architectural world. Though Ethiopia is a country which struggles with widespread poverty and other socio-economic issues, one must not forget that it’s history includes many a kingdom, emperor and dynasty spanning 3 000 years. 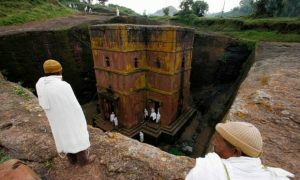 One of the gems from this bygone era is the Church of St George in the town of Lalibela. The Eden Project is much more than an architectural gem. More than anything, the project is aimed at connecting people with the earth and envisioning a future where humans can once more co-exist with their fellow species and environment. 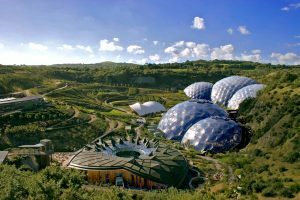 The biomes of the Eden Project house the largest captive rainforest as well as numerous gardens, exhibitions and even holds summer concerts. Not quite a modern architectural gem, but certainly one of the most mysterious, Por Bajin in Siberia has mystified people for ages. 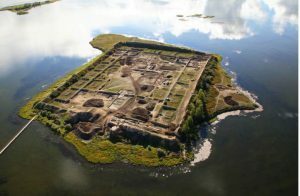 Situated on a remote lake high in the mountains of siberia, the medieval ruins are said to be 1,300 years old and was constructed by nomadic Turkic-speaking people of olden Mongolia and Siberia. Russia may have been in the news for other reasons of late, but one should not forget that the country boasts its fair share of architectural gems. Among these is the trade complex, the Bar Code Building in St. Petersburg. 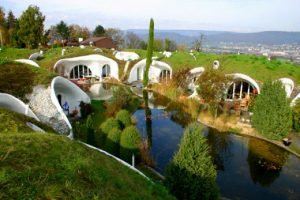 The brainchild of architect Peter Vetsch, the nine Earth Houses of Dietikon, Switzerland combine modern architecture with earthly design and are so popular that more of these villages are planned across Europe. 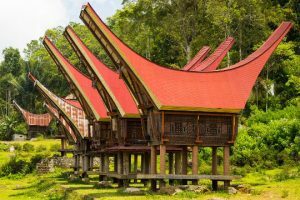 If you’re looking for a unique cultural experience, then a visit to Toraja Village in Indonesia will offer you a glimpse of the Torajan people and their traditional ancestral houses known as Tongkonan. The structures showcase an oversized saddleback roof placed on distinguished boat-shaped structures built on piles. 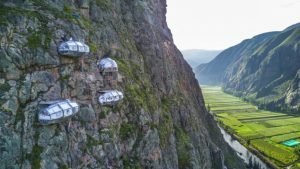 Not for the fainthearted, the Skylodge Adventures Suites which hang off the side of the Peruvian mountains is undoubtedly one of the country’s finest architectural finds. To reach the crystalline pods, visitors must make a 400 metre climb up the mountain and uses a zipline to safely deposit visitors back to solid ground. If fun is what you’re after, then you cannot overlook New Zealand’s Puzzling World located on Lake Wanaka. The attraction has welcomed local and global visitors for more than 40 years and boast quirky angles, structures, mazes and illusion rooms to entertain one and all. 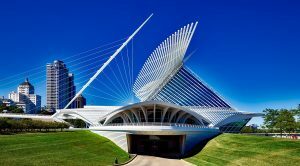 Another well-known entry on our list includes the Quadracci Pavilion of the Milwaukee Art Museum. 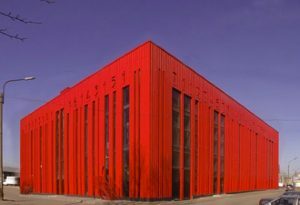 With a reception hall, auditorium, exhibition space, store, two cafes and parking, the structure covers 13 191 square metres and opened its doors in 2001. 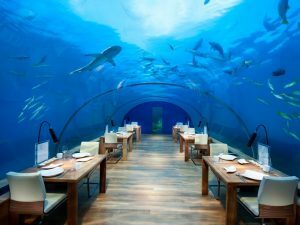 As the first all-glass undersea restaurant the Ithaa can be found five metres below sea level at the Conrad Maldives Rangali Island hotel. As one could expect, the restaurant is an expression of opulence with a menu which boast caviar and lobster in a 180-degree panoramic underwater setting. 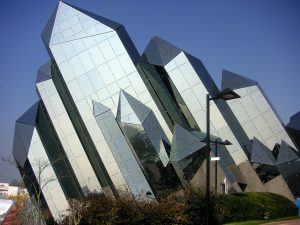 Located approximately six miles from Poitiers in west-central France, the Futuroscope may at the onset seemed like a rather cold and lifeless building, but one could not be further from the truth. In actual fact, the buildings serve as an amusement park and business district and was conceived by politician Rene Monory in the 1980s. 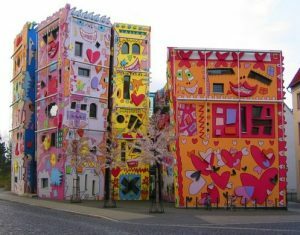 Staring at Happy Rizzi House, one can hardly take the building seriously, and yet this is exactly what New York pop artist James Rizzi had in mind with the playful and colourful building. Though the business district in which it is located had first found the structure somewhat appalling, it has since grown on locals and foreigners alike and breaks the stern face of Brunswick. 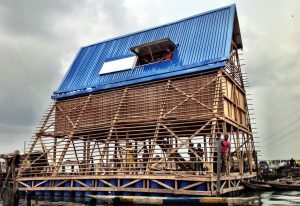 As an honourable mention, we must list the Makoko Floating School of Lagos, Nigeria. Unfortunately the structure has since collapsed following heavy rain which battered the area, the concept was so readily accepted and welcomed by the community that they have vowed to rebuild the structure which served as a school for children in an impoverished area. Check in again next time for more travel news! That’s it for our journey around the globe. Check in on the Rand Rescue blog soon for more #RRTravel news, views and expat adventures. If you need assistance with your finances, be sure to leave your details below and we will get in touch as soon as possible.